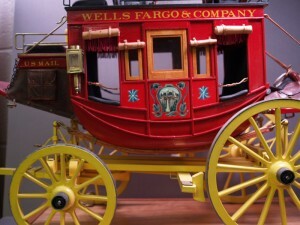 I was inspired to build a stage coach model after watching the 1939 movie “Stage Coach” starring John Wayne. My model is based on the design of the Abbot and Downing Concord Coach built circa the 1830’s. The Coach was described at that time as “an imposing cradle on wheels” by the famous author Mark Twain. I built the model using a 1947 Popular Mechanics plan which I had for over twenty years, knowing one day I would use it! 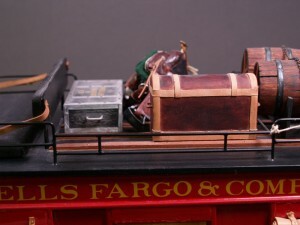 The coach was built on a 1/8th” = 1” scale and consists of the following materials: pine, plywood, leather, brass, steel rods, and 16 gauge sheet metal. Each part is hand-made, and the colors are as authentic as the original coaches were painted based on my research. The paints used at that time were typically brilliant reds and yellows and there was no limit on decorations in that historic time period; “over decorating” the Coaches just didn’t exist! I worked on my model sporadically over a four year period and my techniques improved with trial and error. I was really engaged in building this model and am always interested in sharing more details with any interested club members.